Brands that don’t get on the front foot with a voice strategy will be missing out on a significant share of the market. This was the view of general manager marketing and sales at Village Entertainment, Mohit Bhargava; global business director of voice experience agency Versa, Guy Munro; and chief customer officer of hipages, Stuart Tucker, who were guests on a panel at CMO Momentum on the ‘potentials and pitfalls of voice’. Both Bhargava and Tucker have implemented voice in Village and hipages respectively, and Munro has worked with numerous clients on their voice deployment. Bhargava said Village is working on the Amazon Alexa platform and users can request session times, cross pollinate and compare cinema locations. The UX has evolved to the point where a customer who decides to see a particular film, will be sent a link via Amazon Alexa to their mobile device so they can purchase a ticket. With the impact these voice devices have aready had in the US, it's crucial Australian brands assume this behaviour will cross over, he said. Munro saw a massive opportunity for brands to get at the forefront of voice in Australia. “Versa is centred around creating experience for brand when it comes to voice, looking at what the challenges are within a business and marketing context, what user cases might look like, working with technology, and what platform might best suit a user case, developing those solutions and getting them to market, generally in a rapid timeframe,” he explained. Tucker said voice was crucial for hipages, as its mission is to transform the tradie/client relationship from mutual endurance to effortless efficiency. “It was logical for us to partner with Amazon six months ago and launch a skill for customers to be able to run a search and connect with a tradie through their Alexa device,” he said. “Most humans can speak about 150 words per minute and maybe type 40, so when it comes down to functionality, there’s an inevitability about voice. We must look at security identification, however, if we really want to embed this in people’s lives. 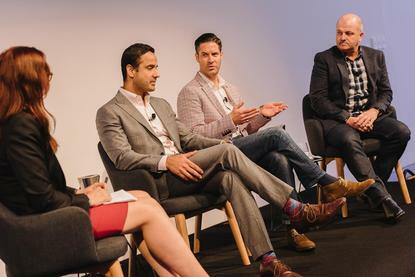 There are, of course, challenges around implementing such a new technology, and each panellist had recommendations around this for brands to consider. “The biggest issue is readiness,” Munro said. “You can have the appetite and interest, but the business may not be there. Where does the ownership lie in the business for voice? Where does the budget come from? Readiness is critical. Bhargava agreed, saying before implementing voice, Village had to define the tone of its brand as well as the purpose of being in voice, and how to deliver on that. "We’ve not historically delved into AI, so we didn’t know what our brand needed to sound like and what language we should use, or what the personality of the brand was," he said. "In voice, there are no visual cues, and we’re a visual business, so that was a real learning for us. There is also no such thing as linear voice design, there’s 50 ways to say hello, people can refer to the same thing in different ways. Key to ask before implementing voice is where you actually want AI to play out in your business, Tucker continued. “You have to decide what you’re prepared to let go of, what you’re OK with AI handling, and where you want a human to jump in. That’s the biggest challenge, what to let go of, versus finding those moments of truth where you don’t want the customer to self-serve. And then giving customers a ripcord where they can jump out of one into the other. I think that’s the key, and then you can decide what voice looks like,” he said. One of the biggest topics up for discussion is where voice will leave traditional SEO search and paid searches. Bhargava positioned voice as the new battleground, and said there’s good reason why Amazon and Google are aggressively trying to take market share. In terms of tips for brands considering getting into voice, Munro said it must come back to use case. Bhargava advised starting small and just getting in market. “These technologies mature, and this is an environment where you can come in an own a category - this is greenfield," he said. "Once you have an active user base you can grow sideways and out to new user experiences as well. A lot of opportunities exist; you just need to start small. “It’s very similar to apps in terms of the data that’s coming out. But you do have to offer a utilitarian benefit to the consumer. If it’s just a gimmick, it will fade, the repeat use you get only comes through providing some value." Munro agreed much like mobile and apps, you must provide utility. “The brands that earned the right to live on the front screen on your phone are the ones that provide utility. And those are the types of use cases that will be validated and supported by voice as well,” he added.